A true English eccentric, Guy Hill is endowed with an almost child-like enthusiasm, passionate about everything he touches. Right now, that mainly means two things: bikes and tweed. 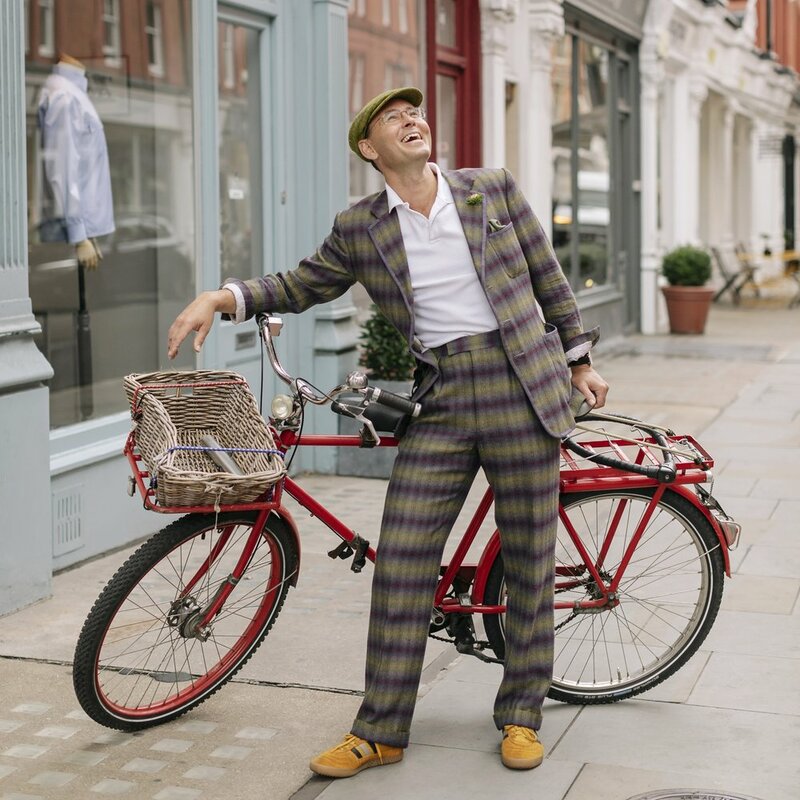 The owner and founder of Dashing Tweeds rushes in fresh from his daily cycle to work, looking sharp in bright blue linen shirt and gold stripy wide-legged trousers in his signature fabric. Tweed may be synonymous with hunting, shooting and fishing, but Guy has dusted off the fusty old image, lending a new urban twist to this classic British fabric. Until recently, he took his children to school on a customised bicycle made for four. “It was like a circus every morning,” Guy chuckles. At his brand’s new shop on Marylebone’s Dorset Street, which opened earlier this year, even the bespoke clothes rail, a hybrid of Duchamp and Picasso, takes the shape of a bike. His Marylebone connection, Guy tells me, goes back three generations. “My Jewish grandmother used to live round the corner in Harley House; my grandfather, Dr Elliot Philipp, was a gynaecologist who pioneered infertility surgery and worked with Patrick Steptoe and Robert Edwards.” Grandpa had a whirlwind courtship—five weeks after meeting, he married Lucie Ruth Hackenbroch, a marriage that would endure for nearly half a century. “We’d always stop off at grandmother Lucie on the way home. She was German and always had chocolate lebkuchen biscuits and she was obsessed by good manners and punctuality—we had to be bang on time, or no lebkuchen,” he says wistfully. The son of an architect and a journalist, Guy first arrived in Marylebone aged six months. The Hills family lived in a flat in York House on Upper Montague Street after his prophetic dad spotted the potential of creating a penthouse on the building’s large and previously empty roof. “It was funny because it was a mixture of glamorous seventies living on one hand, with special brown diagonal striped carpets, mirrors and cruciform columns, then the rest of the roof was like The Good Life. We had a field of wheat and were growing vegetables!” recalls Guy. At Bristol University, his biology degree was not a priority. “I was most interested in dressing-up, parties and taking pictures,” he concedes. Photography remained his passion and, increasingly, became his career. “I was shooting lots of fashion for magazines. I started at the bottom doing teen mags—they used to fly me to Rio every month—then Elle, You, Tatler and Country Life. I had a great time there. I’d always arrange to shoot just before lunch so that they would invite me to eat afterwards in their big country houses,” he chortles. One of his commissions—a portrait of an old tailor, Henry Poole—would prove seminal, prompting as it did an introduction to Anda Rowland of tailors Anderson and Sheppard. “She was trying to save Savile Row, so all the tailors got together to form Savile Row Bespoke. They needed someone to do all the images for them, so I ended up with five years’ work. I had to photograph every tailor on the street and their archives. It changed my life,” he insists. “I was bartering my time for tailoring, so I couldn’t quite believe my luck. I ended up getting a suit from almost every tailor in the Savile Row. It was a golden time for me, almost 10 years ago now—but all the fabrics they had were so dull,” recalls Hills. It was because of that experience—and his conviction that tweeds could potentially be so much more interesting—that Guy would make the transition from photographer to style entrepreneur, through his chance meeting with Kirsty McDougall, who would become his business partner. How did you meet Kirsty? I was looking for some stylists to work with, drove past the Royal College of Arts, went round the degree show, and saw this fridge with amazing fabrics and shoes in it, which attracted me. It was Kirsty’s weaving degree show. I asked her to weave me a one-off from original fabric, and that’s how it all got started. I suggested we set up a little weave design studio, but she needed a loom. “I’d love an Arm loom, which is made in Switzerland,” she said. I said, “If I get you one, will you be able to weave some designs for me?” I don’t really think that she took me seriously, but I went and bought her one of these looms and the rest is history. How was Dashing Tweeds conceived? I really liked the idea of an urban tweed that I could wear round town and for cycling. The first suit that I had woven, I had made by a tailor. My wife tried to persuade me, now we had kids, to wear a fluorescent vest over it—no way. But that gave me the idea to speak to Kirsty about weaving reflective yarns in with the tweeds, forming the whole concept of the brand—modernising tweed, bringing sportswear into an urban environment and then combining it with high-tech yarns like the reflective threads. That was kind of the beginning of the DNA really—of the brand, Dashing Tweeds. What gave me the impetus to turn what was initially a hobby into a brand was Converse. We sent them samples and they made 30,000 pairs of co-branded shoes, which was really amazing. They sold like hot cakes—that was four years ago, and it gave me the impetus to open my shop. I had no idea how hard retail was, but that sparked off a fashion brand. Other collaborations include Pachacuti hats, Fred Perry, Nike, Pharrell Williams and a brand called Billionaire Boys Club. What made you choose Marylebone and Dorset Street? The whole idea of the brand was to be taken seriously as a new luxury British label, so we started out with a really tiny shop in Savile Row in Sackville Street, but quickly ran out of space. I was looking at all areas of London, and then I realised that Marylebone was the place to be. It had independent shops, people who would understand my brand lived in the area; the rent was a little bit less than Mayfair—and the environment so much nicer. I like the feeling of village life, the calm. It’s also got unique individual shops, so the perfect mixture between sophisticated and local community living. I love cooking, buying food, and entertaining at home myself, so I go to The Ginger Pig a lot, and La Fromagerie—that’s my default shopping for dinner parties. I regularly have house parties for my friends with 150 or so people dancing around. I love music—we have a family rock ’n’ roll band, Hills Alive, with the kids. I have a lot of friends in the music industry who come along and play as well. What’s next for Dashing Tweeds? Now we have a much bigger shop, we’re going to have regular social evenings. All our customers love to meet each other and a few of them are quite eccentric—all sorts of different chaps. There’s one who works for the Home Office. He loves dressing up and has his long-suffering girlfriend wait while he’s choosing fabrics. Another chap designs bicycles. They’re all interesting characters. We’re getting into the Japanese market, which is really exciting. I’ve spent so much time building up the menswear aspect of the brand which is all about creative clothes, and men can be quite loyal once they discover you. We are going to slowly introduce a few women’s pieces. We’re getting bigger and bigger now we’re growing up. It’s really exciting—the whole brand, and our relationship with our customers, is going super-duper well. Turning a passion into a business, is very, very difficult. It’s really about keeping your faith.